But unlike my first foray in mutual funds, I researched and found ETF guides that I used in making an informed decision on how to invest in ETF as a newbie investor. I’m sharing this information in this post, so you can also start investing without paying high fees. Nobody wants to spend a lot on fees even if you are a newbie investor. Are you on board the ship of ETF investing? Investing in one stock is risky, but with ETF you are investing in different companies (refer to the fund fact). While you can trade ETF like stock, keep in mind of the taxes. Use Tax Free Savings Account (TFSA) in ETF investing of Canadian equities. It could serve as basket for the ETF and its dividends. What if you want to invest in USA, emerging markets, etc.? Tip: You can invest in Philippine market through First Metro Philippine Equity Exchange Traded Fund, Inc. (FMETF:PS). It is the only ETF in the Philippines that tracks the performance of the Philippine Stock Exchange index (PSEi). If you are investing using a foreign discount brokerage, consider EPHE and PIE. Taxes on foreign investment is somewhat complicated. Such topic is covered in one of the ETF guides. What I do is, I use my Registered Retirement Savings Plan (RRSP) as the basket for foreign investment including Canadian bonds. The taxes are deferred till the withdrawal in retirement or whenever you want (but shouldn’t). Having information overload? Let’s go back to ETF again shall we. I’m not sharing technical steps on how you should invest. Instead, you’ll learn practical steps especially for DIY investors. Read the ETF guides below and fund fact. Choose the ETFs based on your goal and risk profile (are you conservative or aggresive). Compare the fees and returns. Use spreadsheet and add highlights for emphasize. Mark your favourites if you like. Observe the return on investment (ROI) and most importantly do not be afraid to make a change. The process of choosing takes a while but the knowledge you learn is priceless. It will serve as a foundation for future financial planning. This is just a start. So don’t get hang up with the many choices. You’ll likely buy or sell ETFs as you keep on learning. It’s a great way to practice trading and be comfortable with volatility. These are the blog posts that help me to start investing in ETF. Spend time in each post and you’ll have a grasp of how ETFs can work for you. SRI is a way for you to invest in companies that consider these factors: environmental, social, and governance (ESG). With SRI, you’ll do good and feel good while also growing the investment portfolio. SRI ETF is in my radar and will let you know about it. 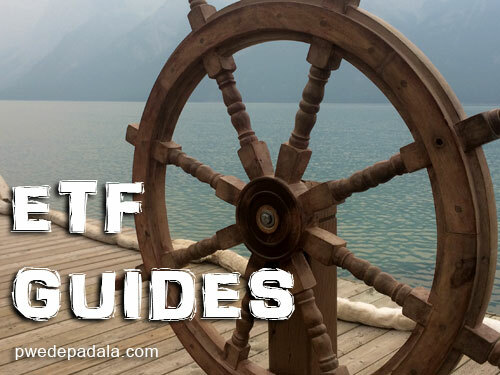 After reading the guides I know you are confident to choose but if you fall head-over-heels with how amazing ETF is, I have more resources for you to delve into. And if you happen to find a note-worthy post, could you share it with us in the comment. What ETFs Do I Have? I knew that you would ask so might as well share my choices. For the firs few years in my TFSA, I bought iShares Core S&P/TSX Capped Composite Index ETF (XIC). I don’t have to pay taxes on profits of Canadian equities if it’s inside a TFSA. Then a year later, I switched to BMO Low Volatility Canadian Equity ETF (ZLB) and couldn’t be happier and at peace. Related Post: What ETFs Do I Have in My RRSP Questrade Account? For beginners, I recommend index investing such as ETF. You could also invest in mutual funds but it has higher fee (MER, trailing fee, etc.) and not as liquid as ETF. Look at the chart and notice the movement of the price. Be comfortable with the volatility because through the movement, the ever-changing price, is the key to lucrative ROI. Learn. Invest. Repeat. And there’s also enjoying the profits in between the process. What ETF do you have in portfolio? What other investment do you consider other than ETF?